The coursework and exams of the doctoral program in Arabic and Islamic Civilizations (AIC) train students in the texts and cultures of the Islamic world with a concentration on the Arab world and the various cultures and religions within it. The dissertation may focus on a particular aspect of one of these cultures or religions, or may be a comparative study. The training provided by the program gives students the tools to do research in the original languages and texts of the major cultures and religions, and helps them to gain broad competence that will serve as a foundation for their research and teaching throughout their careers. Within these areas of study, the program emphasizes the study of religion, literature, and historiography through close reading of texts in their original languages. A well-trained student entering the AIC doctoral program will have studied Arabic (classical/MSA) or Hebrew (biblical or modern) or another Middle Eastern language for at least two years, and will know one or two other relevant research languages (usually German or French). An undergraduate concentration in Islamic Studies, Middle East Studies, or a related discipline is not required, though training in the humanities or social sciences (e.g., languages, literature, philosophy, religion, history, sociology, or anthropology) is helpful. Students with less training are nonetheless encouraged to apply to the program. All applicants are encouraged to consult the faculty of the AIC program prior to their application to seek answers to questions, especially if there are questions about qualifications. Students lacking the proper training may want to apply for the MA program. Students who apply for the PhD program and require more training may be admitted to the MA program. Successful completion of the MA program does not ensure admittance to the PhD program. Students in the AIC doctoral program are required to complete three years of coursework. Usually a student will take four courses each semester (the minimum full-time load is seven courses per year). In a typical semester, a student will take a course in Arabic (or Hebrew) with additional text or content courses. (The latter includes courses such as Quran: Composition, Collection, and Commentary, Islamic Theology, Islamic Philosophy, Sufism, Jews in the World of Islam, The Jews of Muslim and Christian Spain, Arabic Literature-Hebrew Literature, etc.). Text and content courses are chosen in accordance with a student's focus and specialization. Students interested in Jews in the Muslim world or Jewish-Muslim relations should plan to study both Arabic and Hebrew. Each student should consult with all AIC faculty members about course selection at the beginning of each semester. Three years of full-time residence are required at the normal rate of at least seven term courses each academic year. Students who enter with graduate credit from other recognized institutions may apply for transfer credit. By rule of the Graduate School, a maximum of one year of credit (seven term courses) may be accepted toward the residence requirement on the recommendation of the departmental adviser in consultation with the student's adviser. First year students are required to participate in a weekly for-credit graduate Proseminar (NEJS 231a) during the fall. Scholarships and fellowships are generally renewable for four additional years, based on a favorable annual evaluation by each student's professors by May of each academic year. These evaluations will be shared with the students and will be part of the official file, along with grades. Additionally, university dissertation fellowships are available on a university-wide competitive basis for the final year. Students are required to demonstrate competence in primary (i.e., classical/literary Arabic) and two secondary research languages (i.e., German, French, Spanish or Hebrew), according to the requirements of their specific programs. All exams, including the Hebrew and Arabic exams, are composed by the students' advisers. The formats for these exams differ throughout the department, but they are typically three-hour examinations, where a (hard copy) dictionary may be used. Typically, some part of a scholarly article must be translated. The questions and answers for this examination are all in English. Electronic dictionaries are not permitted. All candidates for the PhD are required to pass several comprehensive examinations. Specific requirements vary from program to program (see below). In the semester in which students plan to take their qualifying examinations, they may sign up for Readings courses with the members of the faculty who will participate in those examinations. All candidates for the PhD degree in AIC are required to pass two comprehensive examinations. The first exam, which typically includes a written component and an oral component, tests for knowledge of a broad discipline or body of literature, e.g., the breadth of Arab or Islamic history, central Islamic texts in context, medieval Jewish thought and literature in the Arab and Islamic worlds, or medieval and modern Islamic writings. Precise details should be worked out with the student's adviser. The second exam tests for proficiency in the student's area of specialization related to the proposed area of the dissertation. This may be combined with the defense of the dissertation proposal. In the semester in which the student is preparing for the examinations, the student is encouraged to sign up for reading courses with the members of the faculty who will participate in those examinations. After completing all qualifying examinations and language requirements, students, in consultation with AIC faculty, write a dissertation proposal, following the guidelines provided by the Department. The proposal is then defended in a formal one-hour meeting with the AIC faculty, to help the student polish and prepare it for presentation at the full NEJS faculty meeting. Proposals should be up to six pages in length, plus bibliography. They should contain a clear articulation of the topic with rationale, a summary of current research in its area, its intended contribution to scholarship, methodology, sources, structure and table of contents, preliminary bibliography, and any other relevant material. The dissertation, ordinarily between 250 and 400 pages in length, must demonstrate the candidate's thorough mastery of the field and competence in pursuing independent research; it must also constitute an original and significant contribution to the student's chosen field and topic. It will usually focus upon a particular aspect of Arabic or Islamic life or thought, or of Jewish life or thought in the Arab-Islamic world, but may also be a synthetic study covering the relationships between different cultures and/or religious traditions that have co-mingled within the larger context of Arabic and Islamic civilization. The dissertation is generally written under the official supervision of two AIC faculty members, though all AIC faculty may choose to participate. A faculty member from another program or department may also join the two AIC faculty members as an official dissertation supervisor if required by the specific topic and needs of the candidate. Two copies of the dissertation are to be deposited in the office of the program chair no later than March 1 of the year in which the candidate expects to earn the degree. The student must successfully defend the dissertation at a final oral examination. The AIC doctoral program typically requires a minimum of six years to complete: three years of coursework and language study, one year of preparing for and taking comprehensive exams, and two years for writing the dissertation. The program may take longer to complete as students balance other opportunities and responsibilities. Celene Ibrahim's article "Do Non-Muslims Help or Hurt Women by Wearing Hijabs?" was published in the New York Times Op-Ed section. 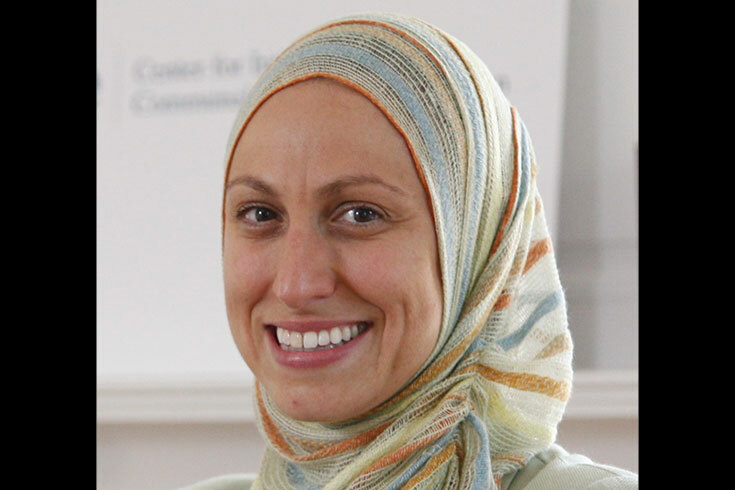 Celene is a PhD candidate in Arabic and Islamic Civilizations.